Jovani has expanded by adding a new fresh and affordable line called JVN. With JVN homecoming dresses you are sure to look like you belong on the runway. JVN by Jovani showcases an exclusive collection that brings a variation of long and short dresses. This collection showcases diverse gowns for all your special occasions such as school dances and parties. JVN by Jovani embraces the latest trends with phenomenal pieces that will make you stand out. Bringing an assortment of styles from strapless to comfortable one shoulders, ruched bodices to tight curve hugging silhouettes. Sparkle the night away with hand sewn bead work that embellishes the silhouettes adding an air of glamour. Their modern styles feature sheer cut outs, trendy illusion necklines, and remarkable two piece prom dresses. 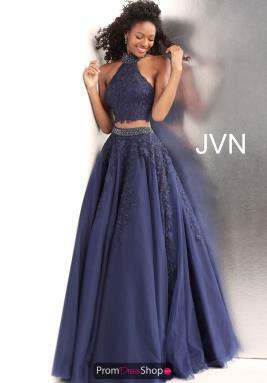 Look flawless at your special occasion with a stunning JVN by Jovani prom dress. To see more from the JVN line, visit the designer's site here.